America is a nation striving after riches. We all have a definition of what it means to be rich, and most of us have ideas on how to get there. Whether these ideas work or not is another matter. But if you are a Christian, then I would like to be the first to congratulate you on winning the Spiritual lottery! You are unbelievably rich. You have more wealth than you could ever know what to do with. Where did all of these riches come from? It came from a relative of yours who has a monopoly on almost everything. And He thinks you are the greatest relative He has, and has just made you His heir! You say, “How rich is He?” He owns all the cattle on a thousand hills (Ps 50:10). Through some wise investment decisions, and very wise hiring of certain personnel, maybe one quarter to one-third of the world’s population works for Him. Even those that don’t work for Him are working for Him whether they realize it or not. He is so rich, anything He wants is His. And guess what, He has just made it known that it is all yours! This comes as a little bit of surprise to you, doesn’t it? Some of you might not have known this. You are like the little old woman who lived in a shack during the days of that great English preacher Charles Spurgeon. He visited her in her shack one day, and noticed a piece of paper nailed to the wall. When he asked her about it, she said that years before, she had cared for an old gentleman, and just before he had died, he had written a little note of appreciation to her followed by his signature. Spurgeon convinced the little old lady to let him borrow the paper, and he took it down to the bank, and upon reading it they exclaimed “We’ve been wondering to whom the old gentleman left all of his money!” She apparently couldn’t read, so Spurgeon helped her get her fortune. That lady was a wealthy woman, but she didn’t know it because didn’t understand the words on that little piece of paper. Many Christians are similar. They are wealthy, but they just don’t know it because either they have never read or don’t understand the piece of paper that tells just how rich they really are. So if that is you, I’m going to be like Spurgeon and point it out to you. We are working our way through the book of Ephesians, and this little letter is about the riches that are ours in Christ. This is the little piece of paper hanging on your wall, or stuffed in your bookshelf at home that tells you how rich you really are, and most of us have never even bothered to read it. Now before we go too far here, you need to understand that these are spiritual riches. Some of you may have been getting excited when I talked about wealth, and you imagined that new BMW that you wanted to buy. The riches we have in Christ are not those kind of riches … they are better. The BMW will get scratched and dented, will rust and eventually stop running. The riches that we have in Christ are eternal and will not fade away or be stolen (Matt 6:19-21). The riches Christians have in Christ are like gold and jewels that fill a warehouse in Heaven, and some of them are for our use right now. The gem we are going to look at today is found in Ephesians 1:7-13 and it is Salvation through Jesus Christ. Turn there if you will. Ephesians 1:7-13. Remember, if you will, that in the Greek, Ephesians 1:3-14 are all one sentence, and reveal three blessings from three sources. The first blessing is Security from the Father. We saw that the truths of election and predestination guarantee our future holiness and inheritance as His children. He has promised that we will be holy and that we will be heirs. In Ephesians 1:7-13, we learn of the second possession. It is Salvation from the Son. Now the word “salvation” is not mentioned until Ephesians 1:13, but everything leading up to verse 13 explains, defines, and is encompassed by the one word “salvation.” And you will notice as we go through the verses leading up to Ephesians 1:13, that the word “salvation” does not refer to going to heaven when we die. The word “salvation” in the Bible never refers to escaping hell so that we can go to heaven when we die. This is what many Christians mean when they use the word, but this is not the way the Bible uses the word. The word “salvation” means “deliverance” and the context tells you what kind of deliverance is in view. So as we work our way up to seeing the salvation we have in Jesus Christ, we need to look at the various descriptions Paul includes to talk about this salvation we have in Jesus Christ. Ephesians 1:7. In Him we have redemption through His blood, the forgiveness of sins, in accordance with the riches of God’s grace 8 that He lavished on us with all wisdom and understanding. Again, Paul begins with that favorite term of his, “in Him.” This blessing of salvation is something that we have in Christ alone. If you look through this long opening sentence of Paul, you see that he uses this phrase “in Him” or “in Christ” quite a few times. All the riches and blessings we have as Christians, we only have because we are in Christ. And what is it that we have in Christ? Paul provides a long list. First, we have redemption through His blood. Redemption is the word used for what God is doing here. Remember last week how I told you that when God adopts us as His sons, He is taking his own children, and adopting them as heirs? Redemption is a similar idea. God is taking something that was already His, and is buying it so that it is twice His. In the ancient world, when a soldier was captured in battle, his country could buy him back from the enemy. Or, when a family was in a desperate financial situation, sometimes they would sell one of their family members into slavery, and then—hopefully—when they got enough money, they would buy back their family member (Lev 25:39-55). We can do the same thing today with pawnshops, except we do it with possessions rather than family members. If you need money, you can go down to the pawn shop and they will give you money for your watch or a ring, and you then have a certain amount of time to go back and redeem your item. If you do not, then they keep it and can sell it for a profit. So we see here that Jesus redeemed us, or bought us back, through His blood. We must understand that when Paul writes about Jesus redeeming us through His blood, we don’t think that Jesus was paying off God or Satan with His blood. It is not as though there was a debt of sin to God or to Satan which could only be paid with the blood of Jesus. Lots of Christians teach this, but it is not a biblical idea. The redemption that Jesus accomplished through His blood was a rescue or deliverance of humanity from humanity. We were enslaved to an endless cycle of sacred violence and the spilling of blood in God’s name, and Jesus, by dying as He did, exposed the myth of redemptive violence and the lies of sacred violence for what they were so that we can be redeemed or rescued from this endless cycle of violence and bloodshed once and for all. I explain this idea further in my Gospel Dictionary course. This idea is further seen by what Paul says next in Ephesians 1:7. Second, we have the forgiveness of sins. Once again, there is so much confusion in Christian circles about forgiveness. But as I have pointed out in my Gospel Dictionary course, in my book The Atonement of God, and in numerous other places, there are two main types of forgiveness sin the Bible. One of these, charizomai forgiveness, is free and unconditional. God extends this forgiveness to all people in all the world for all their sins no matter what. It has been freely extended from the beginning of time simply because God is a loving and forgiving God. Jesus did not have to die to earn this forgiveness. God does not demand blood sacrifice to offer this forgiveness. It is free and unconditional, based solely on the grace of God. The second type of forgiveness is aphesis forgiveness. But it is not really what we think of when we think of forgiveness. It is closer to the idea of release, or liberation. It is the type of release or liberation we get when we gain freedom from the damaging and destructive power of sin in our lives. This type of forgiveness does have conditions. We must confess and repent and forgive others in order to experience this kind of forgiveness in our lives. Guess which type of forgiveness is in view here. The context could almost go either way. The idea of the shedding of blood hints that aphesis forgiveness is in view, since the death of Jesus is one way we learn about how to gain release from our sins. 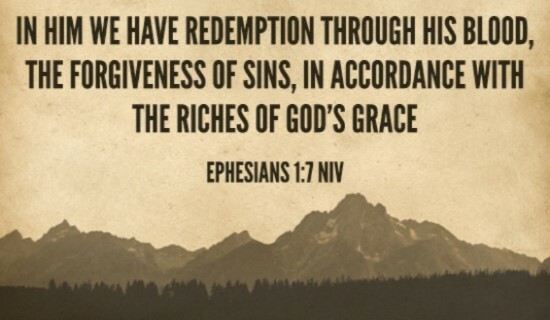 But on the other hand, the last part of Ephesians 1:7 talks about the grace of God, and so we could think that charizomai forgiveness is in view. So which is it? The answer is that Paul is referring to aphesis forgiveness here. And when the rest of the context is considered, this really does make the most sense. Paul is talking about how we can experience the riches and blessings of being in the family of God, and how God seeks to unify us into one family, and how we can live for the praise of His glory. While all of these things are riches of God’s grace, they also are conditional upon our living in light of them. 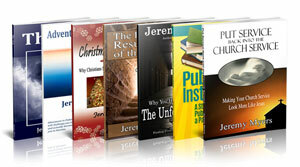 Of understanding what we have in Christ and how to access and use these blessings. So this makes sense that aphesis forgiveness is in view, because we must know how this form of forgiveness works and how to make use of it in our lives. Paul moves on from here to talk about the riches of His grace which He made to abound toward us in all wisdom and prudence. All of these gifts and blessings which God provided for us are due to His grace, His wisdom, and His prudence (or insight and understanding). God knows what we need to live our lives to the fullest and to live as members of His family, and He has made sure to provide us with everything we need for life and Godliness. This is really what Ephesians is all about. But Paul is not done. Ephesians 1:9-10 reveals even more! Ephesians 1:9-10. And he made known to us the mystery of His will according to His good pleasure, which He purposed in Christ, to be put into effect when the times will have reached their fulfillment—to bring all things in heaven and on earth together under one head, even Christ. Have you ever known a secret and just wanted to tell it to someone? It’s always on the tip of your tongue. You have to watch your every word to make sure it doesn’t slip out? You know what is worse though? When you know that someone else has a secret, and you don’t know what it is. The fact that they know something you don’t just eats at your mind. You wonder what it could be, and who it could be about, and how it affects you, and why they didn’t tell you. Paul here in Ephesians 1:9 says that for many years, God had a secret, which He has just now made known to the world. Now Paul calls it a mystery. This does not mean it was hard to understand, but simply that it was something previously unknown. There were clues and hints about this mystery throughout the Old Testament, but now God has made it plain as day and wants the whole world to know. Paul says this was a mystery of God’s will, according to his good pleasure and that it primarily involved Christ, and that the accomplishment of this mystery of God’s will would not be completed until the end of time. Now the verse says, when the times have reached their fulfillment, but what the Greek really says, is “when the dispensations of the fullness of times are completed.” Some translations might say “administrations,” but the best probably is dispensations. Dispensations are ordered stages of God’s work in the world. In our house, we have a certain way we like to do things, and a certain place everything goes. In your house, I’m sure it is quite different. God, in history, has acted similarly. In different periods of time, he has ordered things differently to accomplish his purposes best in that era. This, in a nutshell, is what a dispensation is. Some of you have probably heard of Dispensationalism. Though that theological system gets its name from this verse, don’t think that just because it uses a biblical term, it is therefore completely biblical. This is not to criticize it, for I suppose I am closer to Dispensationalism than the alternative systems, but I have no interest in getting bogged down in that discussion today. So let’s move on. What then is this mystery that God will fulfill in the last dispensation? It is found in the end of Ephesians 1:10: to bring all things in heaven and on earth together under one head, even Christ. This means that however bad things might seem now, just wait, for eventually, Jesus Christ will rule over it all. Now again, Paul is not teaching that everyone will become a Christian here—or that Satan and his demons will be united to Christ. No, this is unbiblical. This verse is saying that Christ will rule over all—will have dominion over all. If you want to see how this works out, read the book of Revelation. Ephesians 1:11-12 then, summarize the blessings of God in Christ that we have so far been given. Verse 11 has one of those huge errors in translation that the NIV sometimes has. It baffles me why the translators took this liberty here, but they did, and so I want to correct it for you today (Author’s Note: I have since switched to the NKJV). The NAS and the KJV have it right. Remember in Ephesians 1:5-6, it says that God’s predestination is to the adoption as sons, which we saw from history and from Scripture means that He has promised to make us His heirs? He has predestined to give us His inheritance. Here in Ephesians 1:11, the word is klēroō, and it means to make someone an heir; to be made an heir, or to be given an inheritance. So verse 11 does not say, “In him we were also chosen,” but “In him we were made heirs.” In fact, the NIV recognizes this with a little footnote, and since they recognize this, I don’t know why they didn’t just make it say what it means. A word with the same root is translated correctly in Ephesians 1:14, “the Holy Spirit is a deposit guaranteeing our inheritance” so I am baffled as to why they translated it here as chosen. Again, Paul is just reiterating the fact that our predestination was not to eternal life, but to the adoption as sons, the redemption of our bodies, the giving of an inheritance to His children. The inheritance, the riches, the blessings, is what Paul is describing in these first three chapters of Ephesians. And it was according to the plan of God, which according to verse 9 was previously a mystery, and this plan will be perfectly worked out according to purpose of God’s will. There are no flaws in this plan. He has the power and the wisdom and the knowledge to carry it out. When you get a promise from God, it is worth just as much as the fulfillment. Is that what this verse teaches? That God causes everything? Even evil? This is not the God of Scripture that I know. So what is this verse teaching? I think it is similar to Romans 8:28. God does not cause all things—but He does work in all things—even evil—so that good may result and His purposes may be accomplished. God works in everything for the praise of His glory. And that is the truth we see in Ephesians 1:12. This verse gives the ultimate reason why God has done all of this for us in Christ. Ephesians 1:12. in order that we, who were the first to hope in Christ, might be for the praise of his glory. The first to hope in Christ were simply Paul and the first believers in Ephesus. But this still applies to us as well. It says that all of this that is done is for God’s glory. It is not for our glory, or our praise, but for the praise of God’s glory alone. The truth of these verses then is that as Christians, we have incredible riches in Christ. We are spiritual multi-billionaires. Finally, the first part of Ephesians 1:13 summarizes all of the riches we have in Jesus Christ by including them as elements within the word of truth, the gospel of your salvation. Ephesians 1:13a. And you also were included in Christ when you heard the word of truth, the gospel of your salvation. The word of truth and the gospel of your salvation are different terms for the same message. This message is simply the good news of salvation. Understanding the word salvation is going to be very important as we continue to work our way through Ephesians, especially when we get to Ephesians 2:8-9. So let us pause briefly here in verse 13 to point out once again that the word salvation does not refer to going to heaven when you die. Instead, the word means “deliverance” and the context reveals what we are delivered from. And Paul, by repeating the words and ideas in verses 12-13 that he also used back in verses 6-7, wants us to see the connection between the ideas. 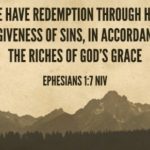 In Ephesians 1:6-7, he wrote about the praise of God’s glory in Jesus Christ the beloved, and then goes on to describe the redemption in His blood and the forgiveness, or release, from sins. So when we see in Ephesians 1:12-13 that Paul repeats himself by talking about the praise of God’s glory in Jesus Christ, we expect to see some similar terminology. And we do. But instead of writing about redemption and forgiveness, Paul uses the word salvation. These ideas are repeated again in verse 14 when Paul once again refers to redemption and inheritance, and so all these themes are wrapped up together. The point is that here in Ephesians 1:13, the word salvation does not refer to escaping hell and going to heaven when we die. It does not refer to receiving eternal life. Instead, it refers to being liberated from the devastating and destructive consequences of sin in our lives so that we can live now, in this life, the way God wants us to live. How? By recognizing the vast storehouse of riches that we have in Jesus Christ, and then learning to live in light of those now. By starting to draw on our inheritance now. This is what the word salvation means in Ephesians. It is not talking about where we go when we die, but rather, how our life is to be lived now in light of the riches we have in Jesus Christ. This is also how Paul refers to salvation in Ephesians 2, which we will discuss further when we get there. The concept of salvation in Paul’s writings is very close to the concept of the Kingdom of God in the teaching of Jesus. Just as the Kingdom of God does not refer to going to heaven when we die, and just as the Kingdom of God refers to God’s rule and reign in our lives right now, so also, salvation does not refer to going to heaven when we die, but refers to the redemption and release from our captivity to sin so that we can live lives of freedom, grace, glory, and joy within God’s family here in this life and for all eternity. So we have seen two great riches in Ephesians 1. We have seen security from the Father in Ephesians 1:4-6, and now salvation from the Son in Ephesians 1:7-13. This salvation from the Son is redemption from captivity and release from the damaging and destructive consequences of sin in our lives. The great riches we have in Jesus not only includes the infinitely valuable free gift of eternal life, but also includes the resources to break free from patterns of sin and to live in our lives as God wants, calls, and desires us to live. In this way, we can rule and reign with Jesus in the Kingdom of God on this earth and for all eternity.